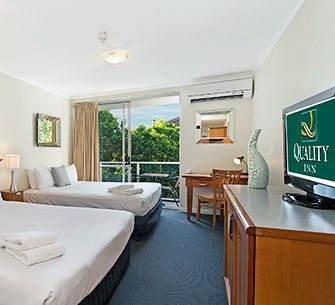 The Quality Inn Airport Heritage offers accommodation of exceptional standard and affordability and is perfectly located for you to enjoy the best of Brisbane. Centrally positioned between the city and Brisbane airport terminals, we are just a 10 minutes’ drive to either. The beautifully presented motel offers 32 deluxe and executive suites, as well as eight serviced apartments. Stylishly designed and tastefully decorated, this affordable accommodation offers fully air-conditioned rooms, cable television, and internet access. Some suites feature private balconies. A lift operates to most suites and are wheelchair accessible*. The serviced apartments are extremely spacious and all containing modern conveniences such as cooking and laundry facilities. They can sleep up to six people in comfort. All serviced apartments boast spacious patios or courtyard areas. Please note: Early check-in is not guaranteed; we offer a secure storage room for your luggage. 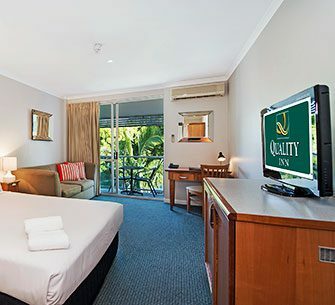 Enjoy unbeatable quality and comfort in our standard deluxe queen suite. Keep your visit to Brisbane simple and stress-free. This suite will have everything you need to live and travel in comfort. A room truly designed for executives and busy people on-the-go. This suite offers all the amenities and luxuries of the home and office to ensure that you can easily balance your life – day and night. The ultimate in efficient, comfortable living. Eat, live, and play in this well-appointed two-bedroom apartment that offers the best of both worlds – hotel style luxury with the amenities of life at home. 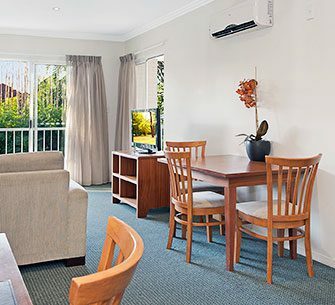 Whether you're a traveller or visitor needing somewhere to stay in a central location, we are situated in Brisbane city and provide quality accommodation.